As a result of sharply deteriorating political conditions in the region, Unocal, which serves as the development manager for the Central Asia Gas (CentGas) pipeline consortium, has suspended all activities involving the proposed pipeline project in Afghanistan. From the 1998 Congressional Record. Mr. Chairman, the Caspian region contains tremendous untapped hydrocarbon reserves. Just to give an idea of the scale, proven natural gas reserves equal more than 236 trillion cubic feet. The region's total oil reserves may well reach more than 60 billion barrels of oil. Some estimates are as high as 200 billion barrels. In 1995, the region was producing only 870,000 barrels per day. By 2010, western companies could increase production to about 4.5 million barrels a day, an increase of more than 500 percent in only 15 years. If this occurs, the region would represent about 5 percent of the world's total oil production. One major problem has yet to be resolved: how to get the region's vast energy resources to the markets where they are needed. 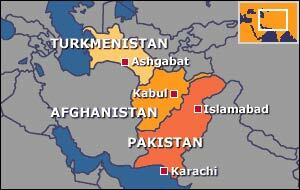 Central Asia is isolated. Their natural resources are land locked, both geographically and politically. Each of the countries in the Caucasus and Central Asia faces difficult political challenges. Some have unsettled wars or latent conflicts. Others have evolving systems where the laws and even the courts are dynamic and changing. In addition, a chief technical obstacle which we in the industry face in transporting oil is the region's existing pipeline infrastructure. I should note that it is in everyone's interest that there be adequate supplies for Asia's increasing energy requirements. If Asia's energy needs are not satisfied, they will simply put pressure on all world markets, driving prices upwards everywhere. The key question then is how the energy resources of Central Asia can be made available to nearby Asian markets. There are two possible solutions, with several variations. One option is to go east across China, but this would mean constructing a pipeline of more than 3,000 kilometers just to reach Central China. In addition, there would have to be a 2,000-kilometer connection to reach the main population centers along the coast. The question then is what will be the cost of transporting oil through this pipeline, and what would be the netback which the producers would receive. For those who are not familiar with the terminology, the netback is the price which the producer receives for his oil or gas at the well head after all the transportation costs have been deducted. So it's the price he receives for the oil he produces at the well head. Mr. Chairman, as you know, we have worked very closely with the University of Nebraska at Omaha in developing a training program for Afghanistan which will be open to both men and women, and which will operate in both parts of the country, the north and south. Unocal foresees a pipeline which would become part of a regional system that will gather oil from existing pipeline infrastructure in Turkmenistan, Uzbekistan, Kazakhstan and Russia. The 1,040-mile long oil pipeline would extend south through Afghanistan to an export terminal that would be constructed on the Pakistan coast. This 42-inch diameter pipeline will have a shipping capacity of one million barrels of oil per day. The estimated cost of the project, which is similar in scope to the trans-Alaska pipeline, is about $2.5 billion. U.S. assistance in developing these new economies will be crucial to business success. We thus also encourage strong technical assistance programs throughout the region. Specifically, we urge repeal or removal of section 907 of the Freedom Support Act. This section unfairly restricts U.S. Government assistance to the government of Azerbaijan and limits U.S. influence in the region. Developing cost-effective export routes for Central Asian resources is a formidable task, but not an impossible one. Unocal and other American companies like it are fully prepared to undertake the job and to make Central Asia once again into the crossroads it has been in the past. Thank you, Mr. Chairman. The two claim that the US government's main objective in Afghanistan was to consolidate the position of the Taliban regime to obtain access to the oil and gas reserves in Central Asia. They affirm that until August , the US government saw the Taliban regime "as a source of stability in Central Asia that would enable the construction of an oil pipeline across Central Asia" from the rich oilfields in Turkmenistan, Uzbekistan, and Kazakhstan, through Afghanistan and Pakistan, to the Indian Ocean. Until now, says the book, "the oil and gas reserves of Central Asia have been controlled by Russia. The Bush government wanted to change all that." But, confronted with Taliban's refusal to accept US conditions, "this rationale of energy security changed into a military one", the authors claim. "At one moment during the negotiations, the US representatives told the Taliban, 'either you accept our offer of a carpet of gold, or we bury you under a carpet of bombs,'" Brisard said in an interview in Paris. An agreement has been signed in the Turkmen capital, Ashgabat, paving the way for construction of a gas pipeline from the Central Asian republic through Afghanistan to Pakistan. The building of the trans-Afghanistan pipeline has been under discussion for some years but plans have been held up by Afghanistan's unstable political situation. See also: Is the world's oil running out fast?